I was inspired to create some sort of a toy for Zac out of this big box we got in the mail the other week.... but I wasn't quite sure what to do with it. 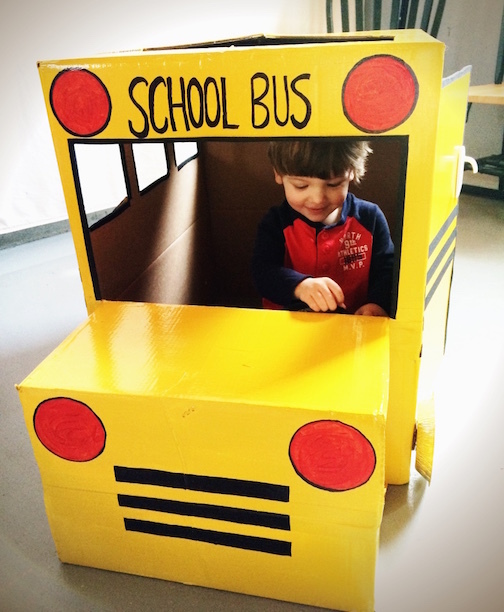 Then it finally dawned on me that I could paint it bright yellow, cut out some windows, and pretend it's a school bus. But, I'm a bit of a perfectionist. And once I had painted it yellow I realized that it needed black stripes. And once it had its stripes I realized that it needed some red headlights.... and wheels that turn "round and round" of course... and a stop sign that flips open, and a steering wheel that steers... and a door that opens and closes, etc etc. And suddenly I found myself knee-deep in a project that took me 2 full days to complete! But the look on his face when he saw it for the first time made it all worth it! So we've been singing a lot of "wheels on the bus" lately, as Zac acts out the verses passionately. I'm going to need a video of Zac's entire performance please and thank you. This is amazing, Vanessa! So creative! What did you use for the steering wheel and how did you attach the stop sign? I wish I could tell you that I used a special non-toxic paint, but I used what we had available (in the Canadian remote far north), and that was standard house wall paint. how many boxes did it take for you to make this? 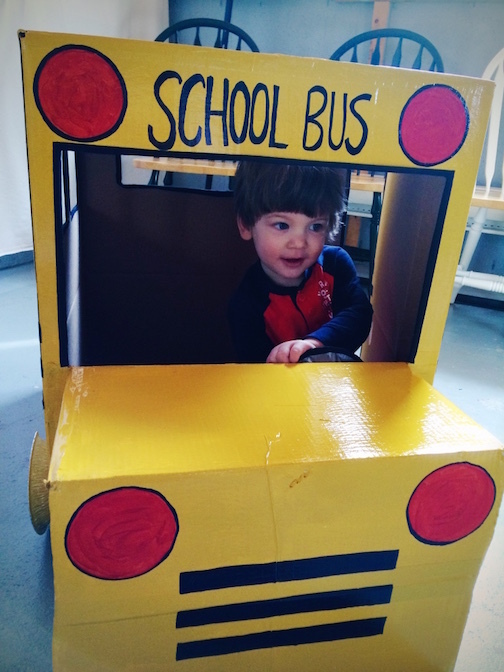 I would love to try and recreate, my almost 2 year is pretty obsessed with school buses! It was actually really easy to make. 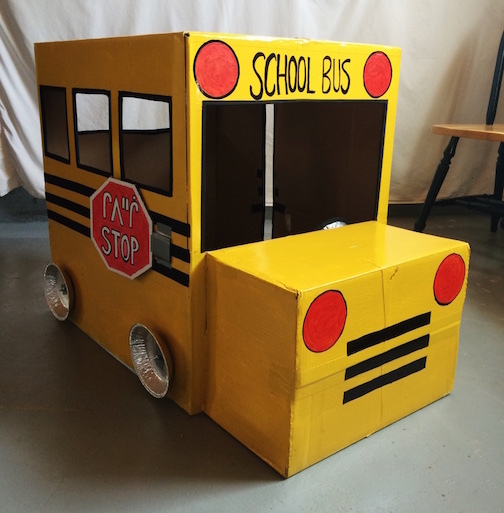 I used 2 boxes, one large one for the bus and a smaller one for the front engine (I use duct-tape to stick it on and simply painted over the entire thing with yellow house paint). Is there any other option for paint? Interesting information. I'm glad you shared this experience. Once a year I do a storytime at my library using a book titled "Not a Box". I have made cars for the children out of boxes and a train out of boxes. 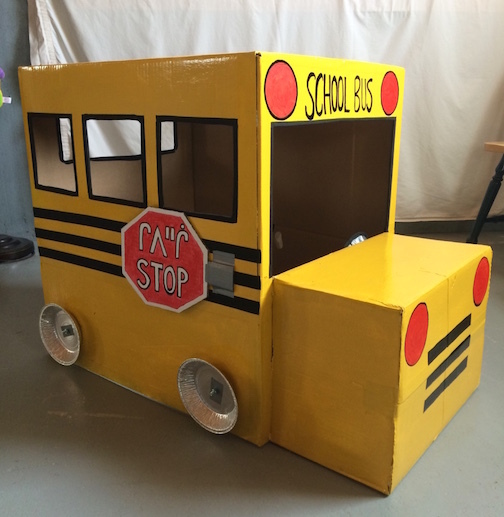 I want to make a school bus this year. What type of large box did you use. You can do it very much.